We were driving down from Denver toward Santa Fe, through the upper Rio Grande valley when sheets of rain rolled in over miles of pinon pine, juniper flats and hills. The sagebrush perked up and permeated the June air with its sweet and astringent smell—an odor both invigorating and instantly grounding. The arroyos freshened with ribbons of red water. Bright green lichen clung to the sharp and broken basalt, edges curling upward to catch the dribbles of rain steaming on the rock. The shower would melt the snow in the mountains a bit more. But the bank-full rivers would only see a slight bump in flow. This is Taos, New Mexico, a colorful desert mountain town for not only paddlers, skiers, hikers, and other adventure-seekers, but also for art enthusiasts, history buffs, and culinary tourists. The hike into the Embudo. There are some aspects of a natural landscape that will forever be part of my soul. I grew up in the high desert and have known these joys from before memory. Exploring this part of Northern New Mexico, the nuances and surprises of a desert with water in it, is not a unique experience. 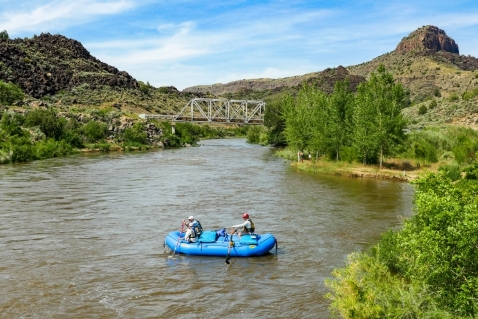 Take Bend, Oregon, or the Jarbidge and Bruneau Rivers in Idaho—take the Gila Wilderness, or Upper Salt River in Arizona. Go see and appreciate all of them for their unique beauty, but come to the Taos region for an especially rewarding experience. This area really has it all: whether you’re a rafter or kayaker, you can find mellow class II or rowdy class IV, experience remote multi-day trips, and charge classic class V whitewater. 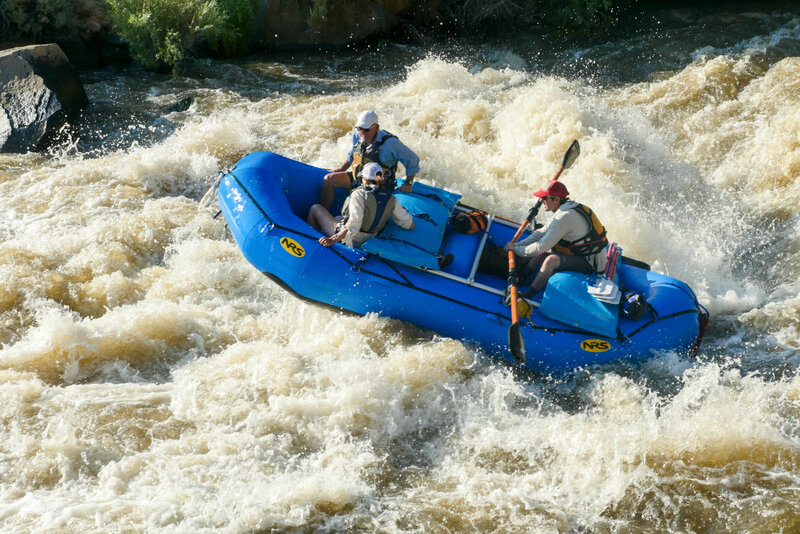 I’ve found that the best information on sections, logistics, rapids, etc can be found at southwestpaddler.com. I always use the American Whitewater page for flow info. However, the community of paddlers on Facebook are indispensable for up-to-date info on hazards, flows and trip planning. A low bridge on the Orilla Verde section that’s best navigated on the far left with few people in the raft. Souse Hole on the Racecourse section of the Rio Grande. 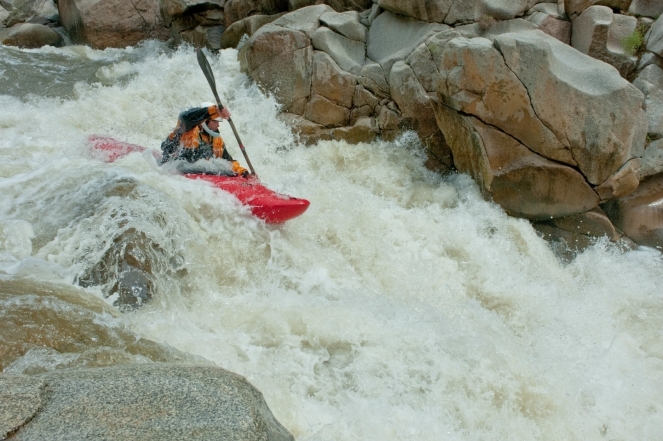 Cheese Grater rapid on the Embudo. The Rio Grande is the fourth or fifth longest river system in North America, and second only to the Colorado for large southwestern rivers. As the river flows into New Mexico from Colorado, it’s flanked in the east by the Sangre de Cristo Mountains. 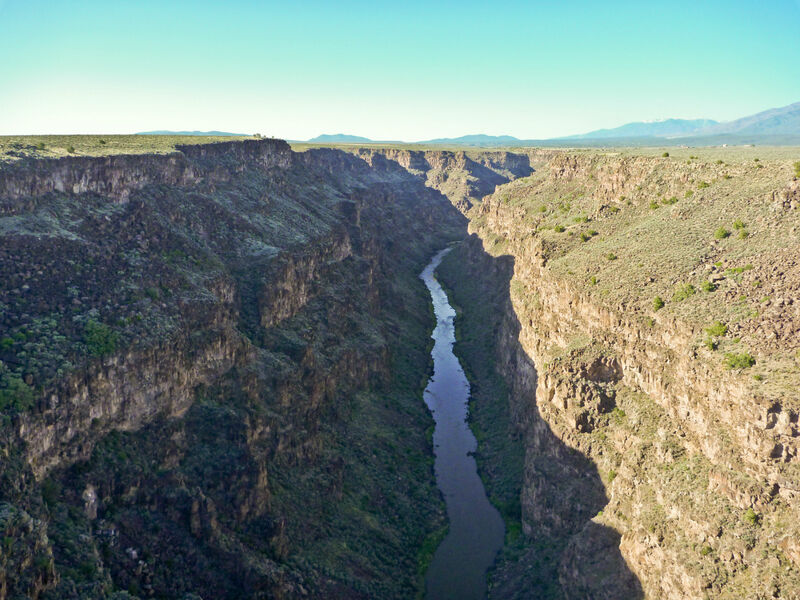 The river cuts the 800-foot-deep Rio Grande Gorge. 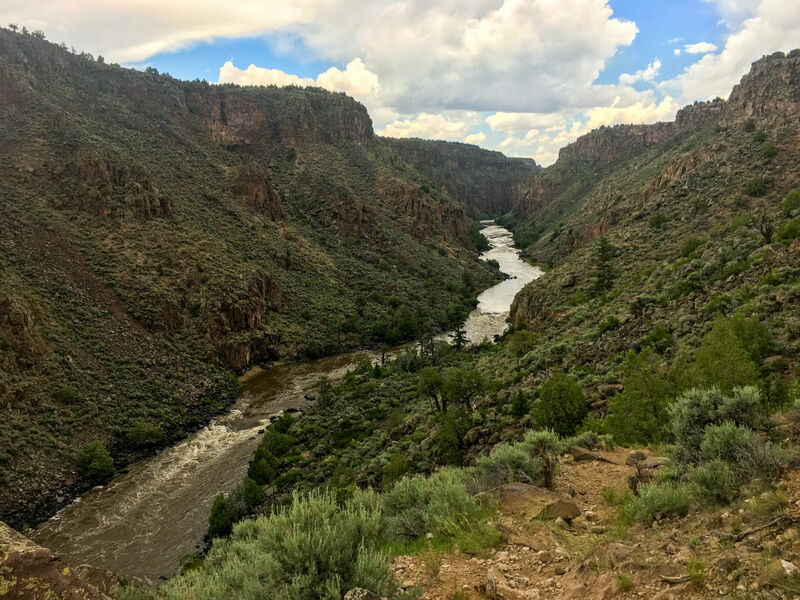 The basalt flows that the river carves through are part of the Taos Plateau volcanic field, however, the river ultimately follows a 29 million-year-old rift valley that extends from Leadville, Colorado clear down into Chihuahua, Mexico. 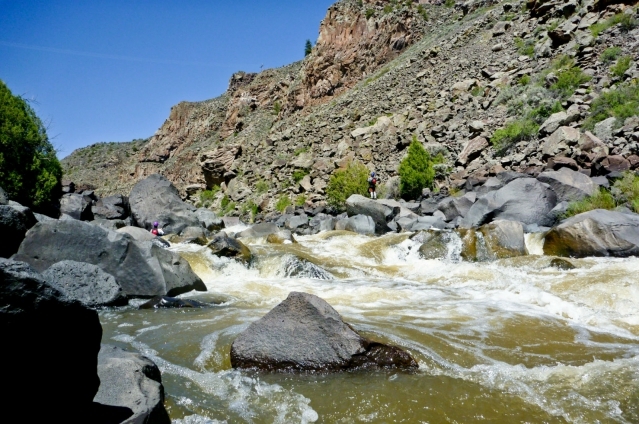 Within a short drive of Taos, there are over 57 contiguous miles of whitewater from II to V. You could choose to add on another 24 miles of class II by starting up in Colorado on the Ute Mountain run, making it over 80 miles of beautiful river with limited impact from humans. 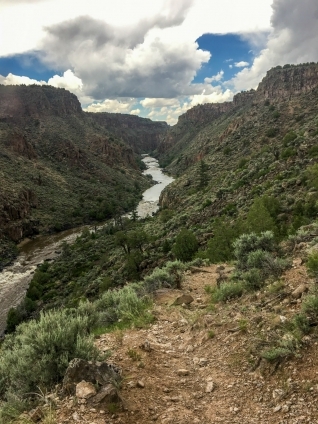 In fact, from the border with Colorado to the takeout for the “Racecourse” section, there are 68.2 miles of river that are protected by the Wild & Scenic Rivers Act of 1968. A “Wild” designation covers 55 of those miles. I’ve run this section twice at normal flows and twice at Richter high flows. It’s sievey, has sharp rocks, requires a three-quarter-mile hike in and a mile hike out of a steep, hot canyon—be mindful of the patches of poison oak, yeah, it even has that. All of this should make this a novel, one-and-done kayak experience for me. However, the excellent whitewater and remoteness make it a gem I’m always eager to return to. Shuttle is easy to bike or drive and you can surely run it twice or three times in a day and get some excellent whitewater and hiking exercise as frosting to your cake. 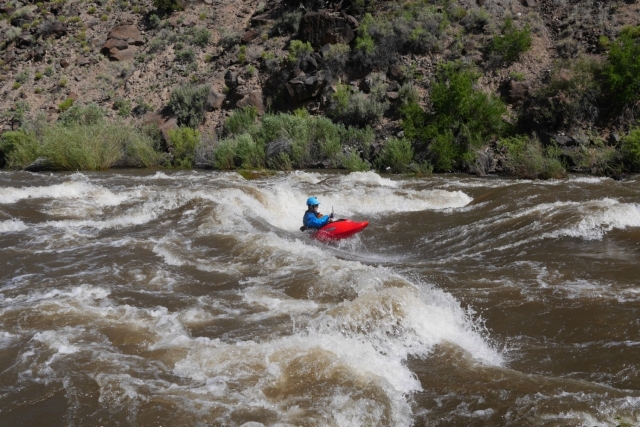 The normal flow for this run is between 350 and 1000 cfs. The rapids channelize the water nicely and you can find deep and padded lines when you’re in the right spot. It’s technical boulder garden style has “must make” lines to avoid dangerous sieves. Go with someone who knows the run and where to set safety. The water is pretty comfortable at these flows and the pools are generally nice and calm between drops. This is a great place to “step up” in your creeking experience. 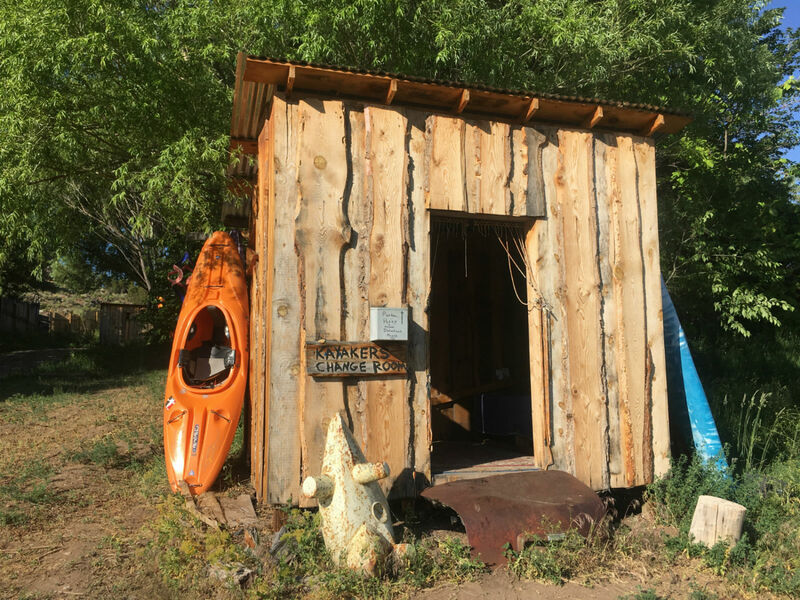 If you’re a kayaker who regularly paddles hard big water, has, or is ready to paddle the Stikine, put the high water Upper Taos Box on your bucket list. It’s steep, pushy, intense, scary, non-forgiving, continuous and…extremely rewarding. If you have a solid roll on both sides “most of the time,” stay away. One missed move could be deadly, a swim here most definitely is. 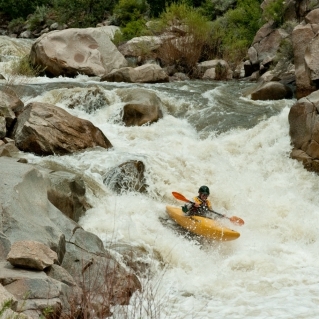 This is the most popular section of whitewater in Northern New Mexico. So much so, while conversing with an outfitter about shuttle logistics, I was told angrily, “Don’t call it the ‘lower’ Taos Box. It’s just the Taos Box—okay?” If this run was near any metropolitan area, it would be another South Fork American, Chattooga, Gauly or Arkansas. 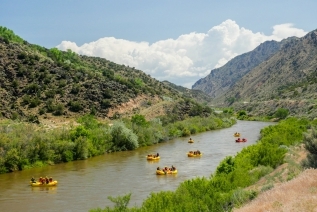 As it’s directly outside of Taos, a thriving tourism destination, it still gets its share of commercial rafting business, but it doesn’t feel crowded. This run has it all—the scenery, the wildlife, and the whitewater. Nearly 15 miles of pool/drop class III and IV with no access points between the put-in and take-out make this a long full day of quality whitewater. The rapids are fun, splashy steep and semi-technical. Bring sunscreen, a hat, lunch and plenty of drinking water. One great way to see this stretch of river is to link up the mellower section directly upstream and make it a multi-day self-supported kayak/canoe trip. Orilla Verde (II), 6 Miles. The Orilla Verde section by contrast to the Box runs upstream, is mellow class II, quick access and a pleasure to visit at any season. 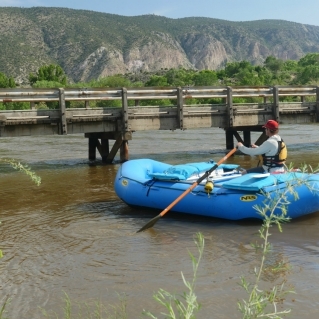 The put-in is at Taos Junction Bridge a handful of miles upstream from the town of Pilar. Most of the run is surrounded by BLM land and is bordered on one side by a light traffic road. As you near the small town of Pilar, be mindful of the sound ordinance. If you forget, signs are posted to remind boaters to keep their voices conversational and not to stop unless there’s an emergency. This is my favorite summer evening playboat spot anywhere. Once you’re familiar with the run and comfortable paddling whitewater in the dusk, try doing an evening lap here. The traffic along 68 subsides, and as the sun sets, all the colors become more vibrant—think orange clouds against an indigo sky. The hot daytime temperatures cool off and it feels good to wear a full drytop instead of the usual shorty. Plus, you’ll get to experience what the river valley feels like with very few boaters on it. 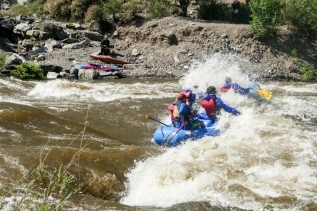 Easy shuttles, short length and great whitewater make this run very popular for commercial rafting. The put-in and take-out, however, have been well designed to accommodate the busses and trailers. You can paddle the full 4.5 miles or choose to park and play at Sleeping Beauty Wave. There are lots of little catch-on-the-fly waves on this section, but Sleeping Beauty really deserves the playboater’s attention. For modern, short playboats this wave can serve up any trick on either side. There isn’t great eddy access for the wave, so if you get flushed and don’t immediately catch the eddy on river left, you’ll have to walk a short distance back but it’s on a great trail. Even considering this, you can spend hours here surfing kayaks, SUPs and surfboards. There is a good spot to hang out above the eddy on river left for a picnic or taking photos. 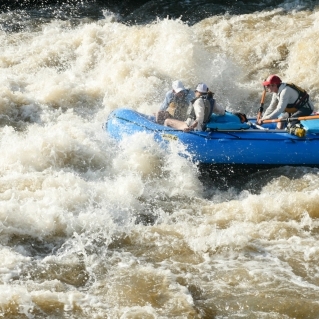 There are two class IV rapids on this run. Big Rock offers a challenging line for kayaks on the left of center or a wide “s-turn” wide enough for rafts on river right. Souse Hole is the steepest rapid on the run and is best run left of center. In June, I rowed this rapid for the first time and was pleased with a partial spin to get the bow up and over the right lateral hydraulic. It’s hard to talk about the Embudo river without talking about Atom Crawford, the kayaker, the dirt biker, river guide, photographer, movie set grip, the local who stayed local. Atom lives at the takeout for the Embudo, hosts the annual EmbudoFest, and likely has more river miles in this area than anyone else. He also grows huge amounts of chiles and garlic on his farm. Atom’s hospitality for boaters is legendary. Several years ago, he built a hut for changing in/out of boating gear, or sleeping in after a bonfire party. One evening sitting around the fire at Atom’s house in Dixon, I asked him for some of the reasons he appreciates boating in Northern New Mexico. I was already making a long list of reasons myself, but he gave me one more I hadn’t considered. “Runoff starts about a month or two sooner than Colorado making this a great place to come and shake the rust off,” he said. And I thought about the well padded boofs earlier in the day. For kayakers on the front range this makes a lot of sense. Most class V paddlers in the Denver area probably hadn’t put their skis up yet, even in mid-April. The kayaker shack at Atom Crawford’s. The Embudo is a desert wilderness run at its finest. 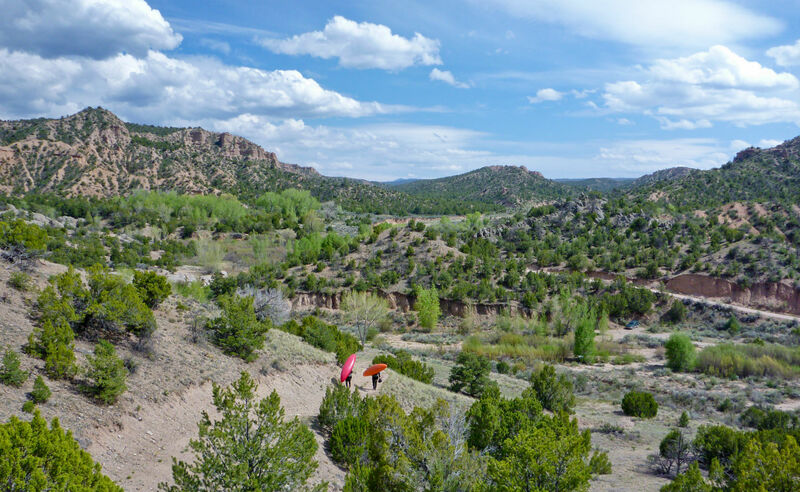 After a 4×4 road to access a trail head, there is a hike in through the foothills of the Sangre de Christo mountains. Mountain lion sightings are not uncommon and rattlesnakes thrive here. Once on the river, it’s steep and unrelenting at an average of 163 ft/mile. The lower gorge is steepest at 200 feet in just a half mile. There are boulder gardens, bedrock slots, undercuts and sieves galore. The canyon is mostly bare “chaucy” granite with cactus and other thorny plants, making a hike-out nearly impossible, with the exception of a hiking route just above the lower gorge on river left. For all you class V kayakers, this should be on your bucket list. It demands serious attention and consequences are severe. I consider it to be good mental training for first descent kayaking expeditions. You have to see the big picture of group dynamics, scouting, last-second line choices. At low water, the rocks are sharp and numerous, at high water, a swim could mean flush drowning. For the patient and seasoned creek boater, you can pick it apart and still have time to appreciate the magnificent scenery. Most of us paddlers consider racing down trails with two wheels or climbing to a glacial lake as great add-on activities to our vacations. 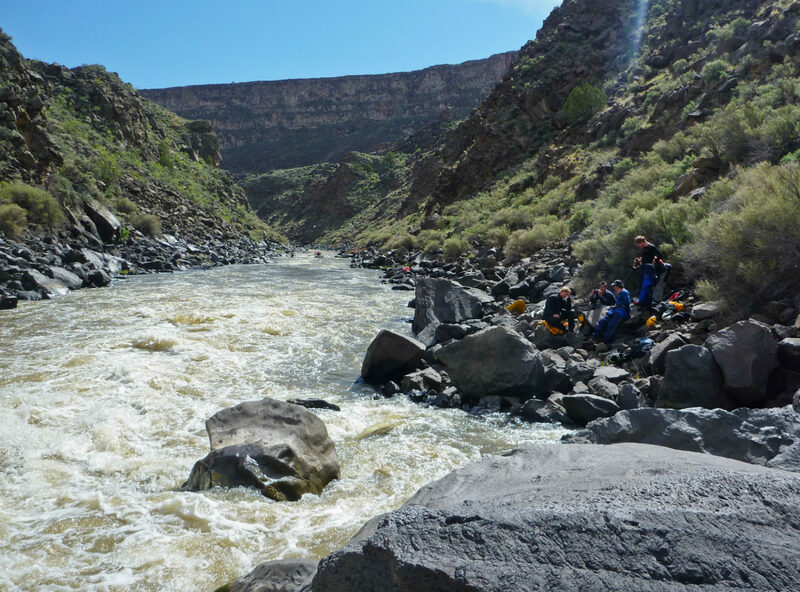 With the Sangre de Cristo Mountain Range climbing up to the east of Taos, these adventures can easily be added to your paddling trip in northern New Mexico. Head toward Taos Ski Valley where trails weave around the resort for both great biking and hiking options. 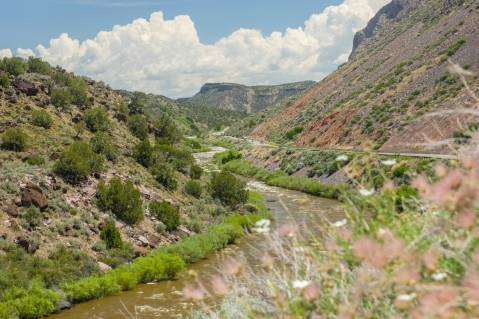 I’ve heard road cyclists covet the valleys and climbs leading into these mountains, as well as the small towns with cafes, galleries, and restaurants found just outside of Taos, such as Arroyo Seco. No matter your budget, you will find rich southwestern fare to fill your belly before or after your time on the river or in the mountains. For a memorable dinner that will leave you satisfied with deep flavors but won’t break the bank, head to Orlando’s just north of town on Route 64. 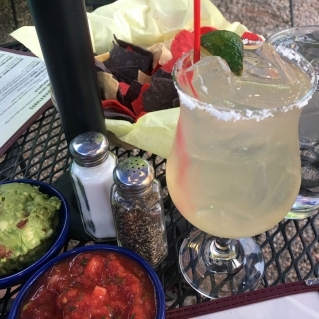 Vibrant decor with an upbeat ambiance, great margaritas and a classic selection of New Mexican cuisine options make dinner here a fun experience. 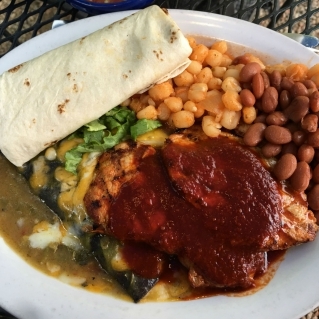 For a quick and easy food option (think burrito on your way to the Upper or Lower Taos Box sections of the Rio Grande) stop in at Toribios, located at the turnoff for Route 522 north of town. This region has many more river options than those I’m most familiar with. I can’t wait to go back to explore more. 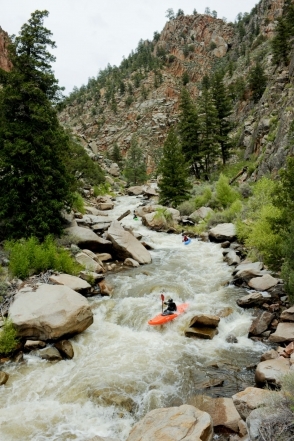 No matter where you call home, come to visit the Taos area to paddle. 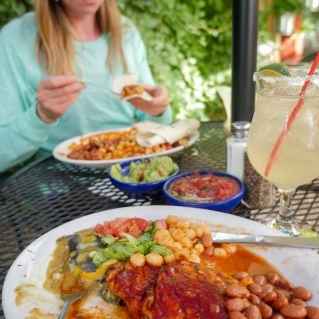 Stay a while and hit a trail in the Sangre de Cristo Mountains and enjoy some of the best southwestern cuisine in the state. If any readers have suggestions on different rivers, or different sections, tell me in the comments.